York Street presents a wide range of gardens and collections on 24 acres that illustrate an ever-widening diversity of plants from all corners of the world. Distinctive gardens define and celebrate a Western identity and a unique high altitude climate and geography. Many of the innovative gardens are models of drought-tolerance and showcase native and adapted plants that thrive in Western gardens. Throughout the Gardens, the time-honored traditions of European horticulture merge with a dynamic diversity of plants and design that represent the best in horticultural achievement. Denver Botanic Gardens began in 1951 and is one of the most visited and well-loved botanical gardens in the United States. 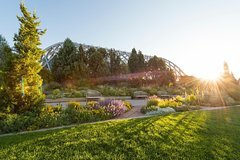 Accredited by the American Alliance of Museums, the Gardens’ living collections encompass specimens from the tropics to the tundra, showcasing a plant palette chosen to thrive in Colorado’s semi-arid climate. The Gardens’ York Street location near Capitol Hill is a dynamic, 24-acre urban oasis in the heart of the city, offering unforgettable opportunities to flourish with unique garden experiences for the whole family – as well as world-class education and plant conservation research programs. The three-acre Mordecai Children’s Garden sits atop the parking structure and provides hands-on plant education and play spring through fall. While most of the gardens highlights Colorado native plants, there are beautiful gardens designed to showcase plants from around the globe, including Asia, the Middle East, South Africa, Patagonia, South and Central America and beyond. Special events, art exhibitions and guided tours takes place throughout the year. Nearly all of the York St location is wheelchair and stroller accessible; there are a few gravel paths and stairs, but different routes can be taken to see the area. Two dining options: Offshoots Café (open all year) and The Hive Garden Bistro (three-season) offer full meals, snacks and beverages. The Shop at the Gardens presents an incredible selection of garden-related tools, books and décor, along with locally-crafted home décor, tabletop items, accessories and bath and body items. A children’s section has a great selection of educational tools, books and toys.